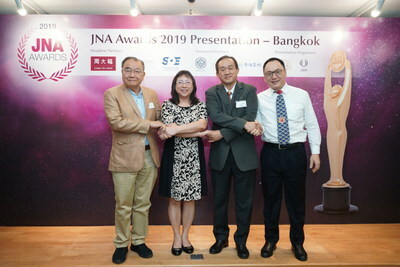 HONG KONG, Jan. 31, 2019 /PRNewswire/ -- The JNA Awards brought its Presentation to Bangkok, Thailand on 30 January, in its efforts to encourage wider participation among members of the Thai gems and jewellery industry. Held in cooperation with the TGJTA, the successful presentation was attended by close to 30 jewellers from Thailand -- all of whom gained valuable insights on the JNA Awards and its core values. Guided by a strong tradition of craftsmanship, Thailand has long been an important manufacturing hub for the international jewellery and gemstone industry, and has contributed greatly to the advancement of the trade. Therefore, the JNA Awards organised the presentation to reach out to more jewellery companies and individuals in the country to join the prestigious award programme. Boonkij Jitngamplang, Ph.D., President of TGJTA said, "TGJTA is very pleased to be part of the JNA Awards. Receiving the JNA Awards is a great honour for the entrepreneurs of the international gems and jewellery industry. TGJTA is confident that the Thai entrepreneurs will utilise this platform to further develop their potential." Kent Wong, Managing Director of Chow Tai Fook Jewellery Group and Kenneth Scarratt, CEO of DANAT, representatives from the Headline Partners of the JNA Awards headed talks on the values that have been gained by their respective organisations since joining the JNA Awards and how the JNA Awards serves as a platform for leading entities in the global jewellery and gemstone trade. James Courage, Former Chief Executive Officer of Platinum Guild International, and Albert Cheng, Far East Advisor of the World Gold Council, both principal judges of the JNA Awards judging panel, also talked about their judging experiences in the last seven years and shared tips on preparing an impressive entry. Representatives from two previous Thai Recipients of the JNA Awards, Li Chongjie, CEO of China Stone Co Ltd and Prida Tiasuwan, Chairman of Pranda Jewelry Public Co Ltd -- PRANDA Group were also present to share their insights. Tiasuwan expressed that "Craftsmen, gem and jewellery products from Thailand are well-known and have been highly recognised in the global market. By joining the JNA Awards, we were given an opportunity to showcase our achievements and ultimately benefitted by securing more business." Similarly, Li shared that joining the JNA Awards elevates industries in Thailand and helps strengthen its reputation as a global jewellery and gemstone hub. "Same as the JNA Awards, our company embraces core values of innovation, excellence and best practices. We are proud to be awarded as Recipients for four consecutive years in five different categories, it is a recognition to our company as well as Thailand as a leading country in the trade," he said. Chow added, "We are honoured to partner with TGJTA and connect more closely with Thailand, a market that plays an important role in the global gems and jewellery trade. Thai craftsmanship is regarded as among the top in the world, their jewellers are also innovative and help move the industry forward." Organised by UBM Asia, the JNA Awards is on its eighth edition in 2019. The JNA Awards is one of the most coveted awards programmes in the international jewellery and gemstone industry. JNA Awards 2019 is supported by Headline Partners Chow Tai Fook, the Shanghai Diamond Exchange, and DANAT, together with Honoured Partners KGK Group, Shanghai Gems and Jade Exchange, and Guangdong Land Holdings Limited.